Molly Birnbaum, America's Test Kitchen Kids editor in chief, helps 8-year-old Lucy Gray make a one-pot pasta meal from a recipe in the new book, The Complete Cookbook for Young Chefs. America's Test Kitchen has released a new cookbook for young chefs containing easy-to-make, kid-friendly recipes, like this one-pot pasta. America's Test Kitchen has long been a reliable source of advice for home cooks. The kitchen tests tools, techniques and recipes before making recommendations through its TV show, magazines and cookbooks. Now, all that know-how is becoming accessible to kids in The Complete Cookbook for Young Chefs. The book has more than 100 recipes for foods that kids love to eat: blueberry muffins, cheese quesadillas, creamy dreamy tomato soup, sesame noodles with snow peas and carrots, chocolate mug cake. Birnbaum is going to show Lucy how to bring one of these yummy recipes to life. Lucy has chosen "One Pot Pasta with Quick Tomato Sauce." Although Lucy has helped with cooking in the past, this is the first time she will prepare a main dish by herself. Before cooking, Birnbaum advises Lucy to assemble all of the ingredients. 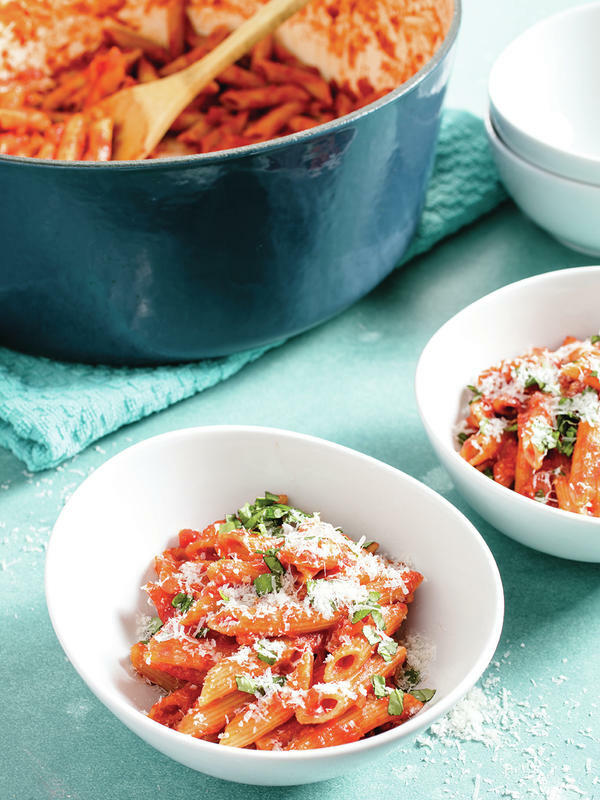 For this recipe, they need olive oil, crushed tomatoes, onions, penne, basil, parmesan and seasonings. As Lucy reads the recipe aloud, she stumbles over some unfamiliar terms. Birnbaum explains that cooking comes with its own foreign language: "There are so many words in these recipes that you just don't know until you've cooked a lot." That's why the cookbook has a section at the beginning called "Decoding Kitchenspeak." It defines terms like "whisking" and "zesting," and explains the difference between chopping and slicing, mincing and peeling, stirring and beating. The cookbook lays out the basics with photographs of tools and equipment, and explains common techniques like how to crack and separate an egg. The cookbook also emphasizes safety, saying that it is an important secret to success in the kitchen. Birnbaum shows Lucy how to hold a knife while chopping an onion so that her fingers will be tucked safely away from the sharp edge. Under Birnbaum's watchful eye, Lucy takes over the prep work and begins to cook the onions. Lucy loves the way the onions glisten as she stirs. "They're beautiful," she says. Next, they add the canned tomatoes. Birnbaum says they did not use fresh tomatoes in this recipe because they want it to work year-round, even when tomatoes are out of season. Lucy notices that they have not yet used the salt they'd placed in a small dish while assembling ingredients. "Are you supposed to put the salt in now?" she asks. Checking the recipe, Birnbaum notes that yes, they should have added the salt while cooking the onions. "Let's put it in right now," Birnbaum suggests. And then she reassures Lucy that it's OK to make mistakes when cooking. "For kids, mistakes are part of the process, and we really embrace them," Birnbaum says. "I think doing a good technique and taking your own spin on it, even if it results in a mistake, is an awesome way to learn how to cook." This recipe is interesting because the pasta is not cooked separately, but added with water into to the simmering tomato sauce. Lucy worries that there is too much water. But Birnbaum assures her that "it's the perfect amount" and will be soaked up by the pasta during the cooking process. Birnbaum says these recipes, like a lot of others in the book, would also work for adults looking to cook something quick and delicious. "I cook from this cookbook all the time," she confesses. "And I don't have kids 8 to 13!" When the pasta is finished, Lucy adds the basil. As a final touch, she grates Parmesan cheese over each portion. Her 12-year-old sister, Kate, digs in. "What's in this?" she wants to know. "It tastes so good!" Their dad, Paul, agrees. "I think this is going to be in our rotation," he says with a laugh, "especially when the kids cook it." That works for Lucy. She is already eager to take on her next culinary challenge. "And then we make dessert!" she declares as she finishes up her pasta. This dish, which is the one cooked by 8-year-old Lucy Gray in this story, is part of a collection of recipes in The Complete Cookbook for Young Chefs, courtesy of America's Test Kitchen. Rather than boiling the pasta in a pot of water, draining it, and then combining the cooked pasta with the sauce, you can actually cook dried pasta right in the sauce (which means no extra pot or colander to wash!). To help the pasta cook evenly, it's important to add a measured amount of water to the pot with the sauce. By the time the pasta is cooked, the sauce will be the perfect consistency and the pasta will have absorbed some of the sauce, so it will taste better. Talk about win/win. "America's Test Kitchen" is celebrated as a reliable source of advice for home cooks. They test tools, techniques and recipes before making recommendations on the TV show, in magazines and cookbooks. Now for the first time, America's Test Kitchen is taking that know-how to the youth in the complete cookbook for young chefs. 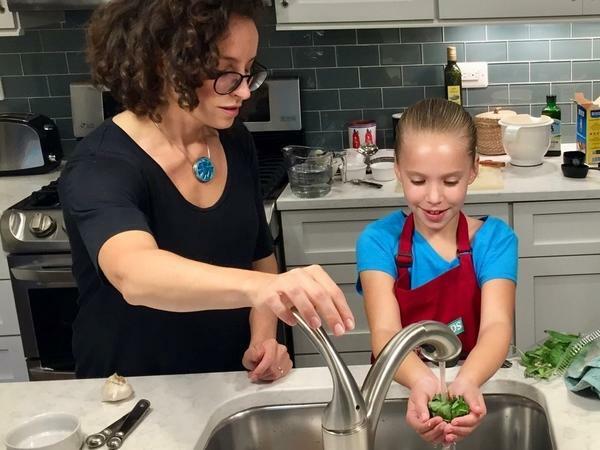 NPR's Lynn Neary recently visited a young chef as she tried out a recipe with some help from an expert. LYNN NEARY, BYLINE: 8-year-old year Lucy Gray is wide-eyed and vibrating with anticipation when her dad, Paul, opens the door to greet me and Molly Birnbaum, editor-in-chief of the cookbook. PAUL GRAY: Nice to meet you, Lynn. This is Lucy. NEARY: So good to meet you. GRAY: We're a little excited, huh? She's a little nervous and excited at the same time. NEARY: Lucy likes to cook and has helped make some meals for her family. But this is the first time she will cook something by herself. The cookbook has more than 100 recipes. And Lucy has chosen to make one-pot pasta with quick tomato sauce. We begin assembling everything we need - olive oil, crushed tomatoes, penne. As she takes out basil, Lucy decides to taste it. NEARY: What does it taste like? NEARY: At one point while reading the recipe, Lucy stumbles over an abbreviation. She doesn't quite understand. LUCY: So this is one tablespoon? MOLLY BIRNBAUM: See, that's a - it says TSP, which is the abbreviation for teaspoon. And this is one capital T. That's a tablespoon. LUCY: OK. Yeah, that's a tablespoon. NEARY: And let me ask you something, Molly. At the beginning of the book, you talk about sort of the language of the kitchen. BIRNBAUM: Decoding kitchen speak. There are so many words in these recipes that you just don't know until you've cooked a lot. So it is a lot about understanding the foreign language that comes with cooking. NEARY: The cookbook lays out the basics with everything from photographs of tools and equipment to instructions on how to measure mints and chop. This recipe calls for a chopped onion. But first, it has to be peeled. LUCY: This is fun. You're like, what's inside? NEARY: The cookbook emphasizes safety in the kitchen, which Birnbaum demonstrates when chopping the onion. BIRNBAUM: It can be hard to make this first cut. BIRNBAUM: So - yeah, and you see how my fingers are like this little bear claw? And that means that my fingers are never going to get accidentally under the knife. So this is the safe way to hold a knife when you're cutting anything. NEARY: With prep work finished, it's time to cook, beginning with those chopped onions. BIRNBAUM: Here's your spoon. And so we want to stir the onions pretty frequently. You don't have to do it constantly. LUCY: Get all softened. Voila. NEARY: After adding garlic, Lucy pours in the tomatoes. BIRNBAUM: I'll take this spoon. NEARY: As the tomatoes begin to simmer, Lucy notices an ingredient that hasn't been used yet. LUCY: Am I supposed to put the salt in right now? BIRNBAUM: ...Which is totally fine 'cause let's just put it in right now. NEARY: Birnbaum assures Lucy that it's OK to make mistakes when cooking. BIRNBAUM: For kids, mistakes are part of the process. And we really embrace them. So I think that doing a good technique and taking your own spin on it even if it results in a mistake is an awesome way to learn how to cook. NEARY: In this recipe, the pasta is not cooked separately. It goes right into the simmering tomato sauce. BIRNBAUM: All right. So the next step - let's look at the recipe. LUCY: It's water and pasta. NEARY: Lucy pours out the pasta, then adds water. LUCY: Now we got to mix it and make it look like pasta (laughter). OK. I think we added a little too much water. BIRNBAUM: No, that's perfect amount of water. NEARY: Now we settle down to wait as the pasta cooks. LUCY: This looks really good. BIRNBAUM: It's starting to look different, isn't it? NEARY: I love this idea of doing the sauce and the pasta together. BIRNBAUM: Yeah, I love this recipe. It's so much easier. It's truly a one-pot dish. NEARY: Yeah. I mean, this is an easy sort of come-home-from-work-and-cook-it dish. BIRNBAUM: I cook from this cookbook all the time. And I don't have kids in the 8 to 13 at home. NEARY: As the timer winds down, Lucy counts the seconds. LUCY: 5, 4, 3, 2, beep. NEARY: Once the pasta's finished, Lucy adds the basil. And as a final touch, she grates parmesan cheese over each portion. As Lucy serves her guests, her older sister Kate digs in. KATE: What's in this? It tastes so good. NEARY: When dad's turn comes to taste it, he agrees. KATE: It should become a new, like, routine dinner. GRAY: I think this is going to be in our rotation, especially when the kids cook it (laughter). NEARY: And with that, we all settle down to eat, though Lucy is already looking forward to her next culinary challenge. LUCY: And then we make dessert. NEARY: Lynn Neary, NPR News, Washington. Transcript provided by NPR, Copyright NPR.